First off, let's get the pink elephant out of the way. I'm 13 weeks pregnant today! I've been leery to announce it on the blog up until this point. Today we got to hear the heartbeat for the first time though, and the baby sounds nice and healthy! Up until now I haven't made clothing specifically for maternity but I have been focusing on clothes that can accommodate my growing belly. I've never been one to follow color trends in previous seasons but Pantone's Spring 2013 Fashion Colors has really inspired many of my recent fabric purchases. So when Pattern Review announced a contest based on this season's Pantone colors, I knew I was up for the challenge. 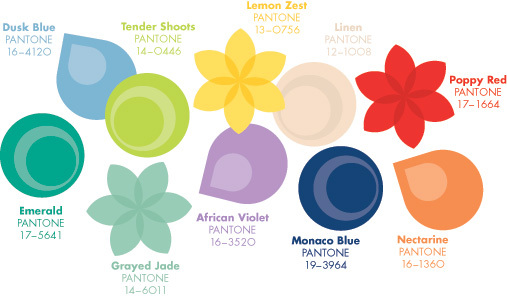 In short, the participant must create a two piece look showcasing the Spring 2013 Pantone colors. I used two patterns, both from Megan Nielsen's maternity line. I had actually used some birthday money to splurge on the Maternity Survival Pack. I've collected several maternity patterns but I really like Megan Nielsen's designs. Instead of extra roomy pop-up tents, she really tries to accentuate the belly without compromising on style or comfort. The top is made using the Ruched Maternity T-shirt pattern. This style is an absolute staple in a pregnant woman's wardrobe. 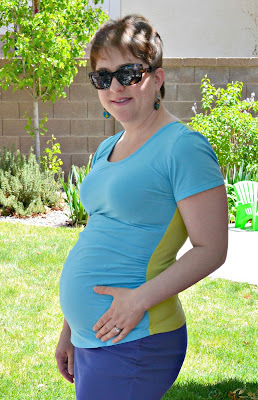 I have a couple of RTW tees I had purchased during my first pregnancy and I wore this style to death. It's nice to have a pattern to make unique versions that you can't find in all of the maternity departments. I used rayon jerseys, both purchased from MoodFabrics.com. My color inspiration was "Tender Shoots: 14-0446" for the green and "Dusk Blue: 16-4120" for the blue. My initial idea was to hack the front pattern piece up and run a band of the green fabric across the bust... so cliche! I did a search to see what others had done with the pattern and found this adorable version. I liked that the front and back of the top were made of two different fabrics. The look was much more fresh in my opinion and easier than hacking up a pattern piece. The top was very easy to construct. The instructions are very easy to follow. I love the end result! I know I will be making more of these in the next few months. In her instructions, Megan also shows how the pattern can be lengthened to make a dress and I think that's what I will be doing next when I make this up again. Next up is the Ruched Maternity Skirt. This pattern is not for those who wish to downplay the bump! It accentuates every bump and curve! My color inspiration was "Monaco Blue: 19-3964". I had a difficult time finding a heavier knit that would both work for the skirt and be close enough to my inspiration color. I scoured high and low online and in stores and finally stumbled upon this knit at Joann Fabrics. It's actually a tubular ribbed knit. But it is both heavy enough for the skirt and was very close to Monaco Blue. This was also a fast and easy project. After reading some reviews, I decided to go up one size. The skirt is very form fitting and I wanted to make sure I could wear it well into the second and maybe third trimester. I think the extra size gives me a little more room to play with but doesn't look too big or baggy. Although I bemoan having to gain weight, I love rocking the bump and this skirt lets me do just that! I'm really excited to see how every one's projects turned out. There's already some beautiful outfits up in the gallery now. Voting begins May 3- be sure to check it out! Also, if you haven't done so already, head over to the April Giveaway to enter to win a Shabby Apple gift card! You may enter until midnight April 30th. I almost want to be mad at you - you look so good. Pregnancy is VERY becoming of you. Congratulations. Your top looks amazing. oooo how exciting congratulations!! Love the top looks fantastic. Hopefully you get lots of use from the Megan Nielson pack they are such good little patterns! Good luck with the PR competition. Congrats on the bump and lovely job on the top and skirt! Congrats! Those are great maternity pieces! Congratulations!! You look terrific and your outfit is very cute! Yay!!!! Congratulations on the your pregnancy, it's always so exciting. Nice shirt. Congratulations. You look terrific and your t shirt is beautifully colour blocked in these gorgeous shades. Congrats! This seems like a very stylish maternity top, I hope you get a lot of wear out of it. I really like the idea of a top being a different color in the front and back, I'm trying to make some more basic t shirts and I may have to steal your idea!